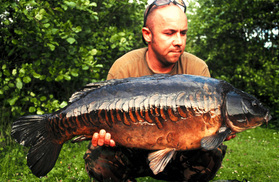 Being a top angler what would you say is your biggest tip you have learned to give you that edge over the wary carp? What would you say has been your best capture? Best Capture, that is a difficult one as all have been unique and meant as much as the other captures in their certain ways, but if I had to be Pushed it would have to be the “Woodcarving” from Horton, it was the fish I just really wanted to catch at the time from there and was fortunate enough to land her/him, it made it that much sweeter that is was on a 50mm bait !!!! I don’t really have a banker rig as each rig I have used or use is a banker for that specific lake or fish im targeting, I like bottom bait rigs, popups, chods, hinged stiff links, pva bags, really I use all and everyone of them if it’s the way to keep my net wet and smiling for the camera…. When would you start to look to introduce your spring bait and what are you using this season? Im in the fortunate position that I have designed a bait with Alan Parbery at Mistral that is a true “4Season” bait, ive been using it for the past year since I was really hapoy with it and haven’t looked back catch fish all over Europe including a new PB Common of 49lb 12oz from here in the UK…. Have you set yourself any targets this year? If you could get rid of one thing from carping what would it be? With spring around the corner what are your steps to prepare for the warming weather? I fish all year round so I don’t really prepare any differently any time of the year, of course kit and clothes will be dfferent, but for spring I like to keep the bait I use to a minimum and use bright ones as singles or over a scattering of bait, ill also start to introduce some oil like hemp oil or salmon oil as the water temp rises to drag them fish down onto my baits, this may sound strange but ive personally always done just as good in the winter months as in the spring so its just another season for me to get my head around the fish and hopefully keep on catching them….